Make your memos more fun with this version of a classic peg board. This Kawaii Peg Board features 185 letter, number and character pegs as well as a nice bright peg board, all of which allow you to get your message across in style. 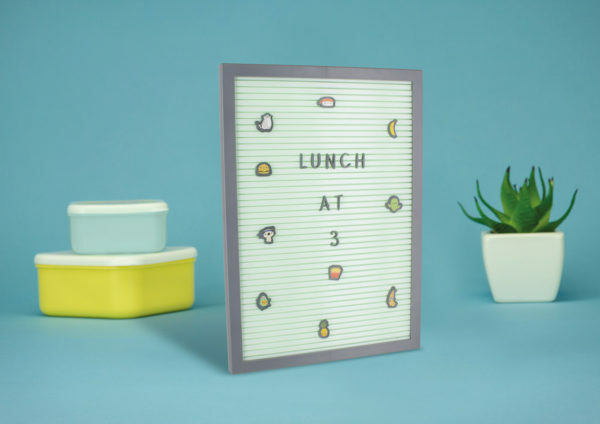 This peg board is great for leaving messages for friends and loved ones, and there are even a few fabulous, cute characters to brighten up your day. The board is 30cm x 22cm (12″ x 8.5”) and can be free standing or wall-mounted. This Kawaii Peg Board is a part of Paladone’s My Kawaii range. My Kawaii is a fun and funky range of accessories that draws inspiration from the quirky and adorable designs that come right out of Japanese pop culture. With cartoon-esque super-fun characters, from cute critters like cats, dogs and llamas, to smiley fruits, plants and even food, the My Kawaii range is perfect for people who like vibrant bright colours and lots of fun!